MARCH 15--The hacker who has spent the past several months breaking into the e-mail accounts of family, friends, and political allies of the Bush family has crossed party lines and illegally accessed the AOL account of a former senior White House adviser to President Bill Clinton. The intrusion into Sidney Blumenthal’s e-mail account apparently occurred this week, days after the hacker--who uses the alias “Guccifer”--defaced Colin Powell’s Facebook page and breached the former Secretary of State’s AOL account. The 64-year-old Blumenthal--who was unaware that he had been hacked by “Guccifer”--worked as an assistant and senior adviser to Clinton for about 3-1/2 years, ending in January 2001. He worked as a senior adviser to Hillary Clinton’s 2008 presidential campaign and has remained one of her closest confidants. 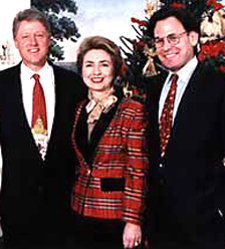 Blumenthal is pictured at right with the Clintons. By breaching Blumenthal’s account, “Guccifer” was able to access his correspondence (dating back to at least 2005) with an array of Washington insiders, including political operatives, journalists, and government officials. As with the hacker’s other victims, it is unclear how Blumenthal’s account was illegally accessed or why he was targeted. However, based on screen grabs made by “Guccifer,” the hacker specifically zeroed in on Blumenthal’s extensive correspondence with Hillary Clinton, sorting Blumenthal’s account so as to single out all e-mail sent to Clinton. Additionally, “Guccifer” further sorted the mail to list (and presumably download) all Word files attached to e-mails sent to Clinton. It is unknown what plans “Guccifer” has for these documents, which include foreign policy and intelligence memos that Blumenthal sent to Clinton while she served as Secretary of State. Blumenthal told TSG that when he attempted to access his e-mail yesterday morning, he could not successfully log in. He then contacted an AOL representative and was told that his account had been compromised. Blumenthal said that he subsequently reset the password and regained control of his account. In e-mail screeds, “Guccifer” seems to subscribe to dark conspiracies involving the Federal Reserve, the Council on Foreign Relations, and attendees of Bohemian Grove retreats. “the evil is leading this fucked up world!!!!!! i tell you this the world of tomorrow will be a world free of illuminati or will be no more,” the hacker declared. Over the past few months, the list of “Guccifer” hacking victims has included several Bush family members and friends; Powell; U.S. Senator Lisa Murkowski; a senior United Nations official; Rockefeller family members; former FBI agents; security contractors in Iraq; a former Secret Service agent; and John Negroponte, a former U.S. ambassador to the United Nations. 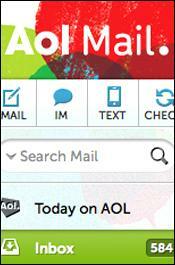 A majority of these breaches have involved AOL e-mail accounts.